Relevance Beta synuclein is an abundant pre-synaptic phosphoprotein that is found in the brain and is homolgous to alpha-synuclein. Beta-synuclein is distinct from alha-synuclein in that it lacks the majority of the hydrophobic non-amyloid-beta component of the Alzeheimer's disease amyloid region. Due to this beta-synuclein is less likely to form insoluble aggregates when compared to alpha-synuclein. It is thought that beta-synuclein may have a protective role against alpha-synucleinopathies. 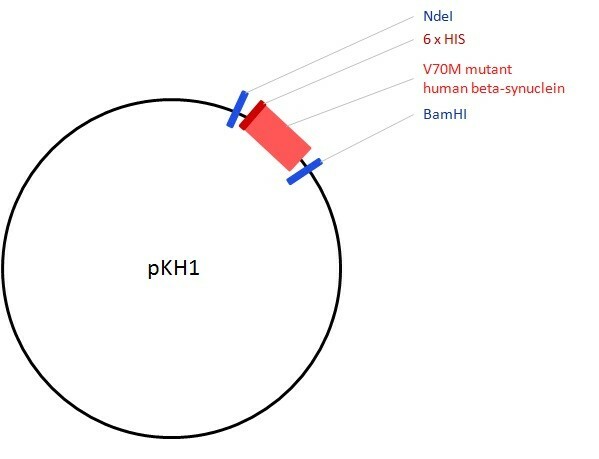 Notes pKH1 ("V70M") is a derivative of pET15b with the open reading frame encoding the V70M mutant human beta-synuclein (β-synuclein) cloned in via the vector NdeI and BamHI restriction sites. It was constructed via site-specific mutagenesis of pJEK12 (pET15b-wt β-synuclein), replacing the G at position 208 in the ORF nucleotide sequence with A, thus altering the 70th codon from GTG encoding valine (V) to ATG encoding methionine (M). In this construct V70M β-synuclein is expressed as a fusion protein with an N-terminal six His tag.